Time and time again Larson Electronics LL line of industrial grade lighting products have been proven to be a popular choice among set designers. In accordance with this reoccurring theme, production crews on the set of the new Amazon series "The Man in the High Castle" have decided to use Larson Electronics LLC EPL-48-2L explosion proof fluorescent light fixture as well. These explosion proof fluorescent fixtures are as tough as they are bright and we can't wait for them to prove their worth on the set of The Man in the High Castle. 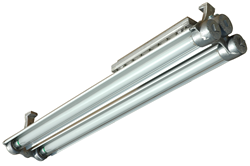 This 4 foot, 2 lamp explosion proof fluorescent light fixture is U.S./Canada U.L. approved for use in Class I, Division 1 and Class II, Divisions 1 and 2 hazardous locations. Each lamp is protected by heat and impact resistant Pyrex tubes while the fixture itself is composed of copper-free aluminum alloy. This T6 temperature rated fluorescent fixture is multi-voltage capable and has been approved for use in paint spray booths. Mounting options include adjustable surface mount and suspension mount, depending on the customers preference. Applications for this explosion proof fixture include, but are not limited to: Paint spray booths, aircraft maintenance, oil rigs, refineries, solvent and cleaning areas, chemical manufacturing, waste treatment facilities and so on. “While it may not seem like it to some, work on a movie set can be very tough and extremely demanding,” said Rob Bresnahan, CEO of Larson Electronics LLC." These explosion proof fluorescent fixtures are as tough as they are bright and we can't wait for them to prove their worth on the set of The Man in the High Castle."